The new set features previously unreleased and newly restored bonus footage, original artwork and more. 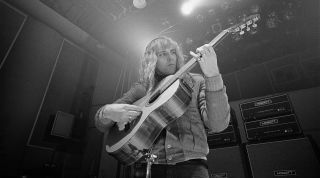 Guitarist Alex Lifeson celebrates his 64th birthday today. This past Friday night, vocalistJon Anderson performed with Yes—his formerband—at the the Rock and Roll Hall of Fame induction ceremony at the Barclays Center in Brooklyn, NY. After recording several albums with 'TilTuesday, Aimee Mann began a successful solo career that spawned a string of eclectic but seriously engaging albums, from 1993'sWhatever to 2012’s Charmer. Today, GuitarWorld.com presents the exclusive premiere of“Human Race,” a gallopingnew song by longtime Triumph guitaristRik Emmett and his band, RESolution9.